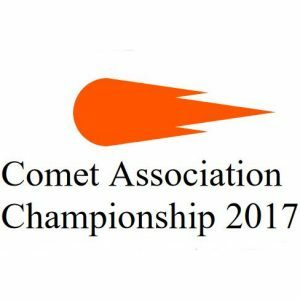 Twenty visitors joined eight local members to sail the Nobel Marine Comet Championships at Attenborough SC. The series was run with three races on Saturday and two on Sunday. The day was sunny with light winds but as the forecast suggested no change through the day the first race got away with little delay. A wind shift just prior to the start resulted in a mass of boats on starboard at the pin end of the line which saw some bots bailing out at the last minute to avoid collisions. Chris Hatton (48, Seven SC) soon got away from the fleet and stayed there throughout the race. Chris Robinson (867, Burghfield SC) and Eddie Pope (804, Ogston SC) keep a 2 and 3 place position from the end of the first beat to the end. After lunch, the wind had not improved and was described by someone as “settled to be variable”. Again the fleet got away to a clean start and by the end of lap one had spread out along the lake. Chris Hatton again exhibited his skill to gain the front and stay there. 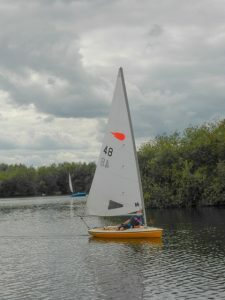 Meanwhile, Eddie Pope was running in second place and Bob Dodds (869, Crawley SC) came through the gate in third place. Further down the fleet little there were few significant changes in position and the race was shortened to just 2 laps after almost an hour of sailing. The first three positions at the end of lap one remained unchanged at the finish. Race three was held back to back which meant quite a long wait for the front runners before the start which again got away cleanly. The wind continued to promise an increase and change direction but then dashed all hopes by fading again. At the end of lap one we had a new face, John Coppenhall (532, Hunts SC) followed by Eddie Pope and Nigel Austin (875, Crawley SC). By the end of lap two, Eddie Pope found a way through to lead from John Coppenhall whilst Bob Dodds had come through from fifth to third. These positions were maintained to the end of lap 3 as the race ended. A small number of Attenborough SC members provided musical entertainment for visitors and club members alike whilst a chinese style meal was provided Saturday evening. Sunday dawned fine and clear but again the wind was light and variable. The OOD tried to get the fleet away at the allotted time but postponed the start to change the start line and the course. The variable wind still resulted in a biased start when the gun sounded but it was another clean start and there were a lot of tacks put in before the first mark. Eddie Pope came through the gate at the end of lap one in the lead followed by Chris Hatton and Nigel Austin. The light winds resulted in a very drawn out fleet along the length of the lake. The race was finished after just two laps with Eddie Pope and Chris Hatton holding onto their positions. Nigel however dropped a place whilst Bob Dodds managed to gain two places to finish in third. The fifth and last race of the series got underway with just twenty boat but a gust caught out several sailors who found themselves on the wrong side of the line and had to go around the end of the line to start. The usual faces however featured amongst the lead boats. Chris Hatton got himself to the front and stayed there throughout the three lap race. Chris Robinson came through the first lap in second place but slipped to fifth in lap three and Nigel Austin slipped from third to fourth. Eddie Pope fought his way from fourth to third on the last lap whilst Bob Dodds came through from sixth at the end of lap one, fifth at the end of lap two to finish in third position.